Russian Customs reports this week that imports of steel pipes from Ukraine have dropped by 50% or more, compared to 2013. Steel industry sources in Moscow are predicting the Russian market may have closed to Ukrainian steelmakers, as Gazprom and Rosneft, the largest buyers of pipes, are directed by the Kremlin to buy instead from domestic pipemills. 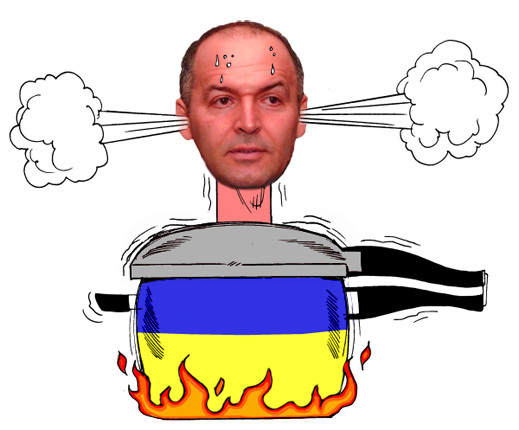 By contrast, Interpipe, based in Dniepropetrovsk and owned by Victor Pinchuk (image), is reporting that within two years it expects the current conflict to have blown over. Sales to the Russian market, Pinchuk’s principal income-earner, will recover to the tonnage and revenue levels the company was achieving before July of 2013, according to the latest Interpipe forecast. That is when the Kremlin halted favourable import-quota arrangements for Ukrainian pipes, and imposed penalty import duties. Interpipe was already loss-making before the Russian market began to close. The year-end loss for 2013 has not yet been released by Interpipe. Counting both operating losses and writedowns of asset value, industry analysts and traders say this week the loss figure is between $100 and $200 million. “A perfect storm” is the way Interpipe is describing its financial situation to creditors. While Interpipe waits for a recovery on its eastern front, the latest export results for the European Union (EU) reveal that Interpipe’s attempts to increase European sales of its pipes are running into tough competition from French and other trade rivals. Interpipe exports to the EU are unlikely, trade sources claim, to compensate for its losses in the Russian market, as well as in Kazakhstan and Belarus, which belong with Russia to the Eurasian Customs Union. About 30% of Interpipe’s pipe sales went to Russia until last year; about 50% to the combination of Russia, Kazakhstan, and Belarus. US assistance to the Ukrainian economy is too little and maybe too late, Interpipe has been telling industry analysts, to allow significant growth over Interpipe’s results in the US market in 2012 and 2013. 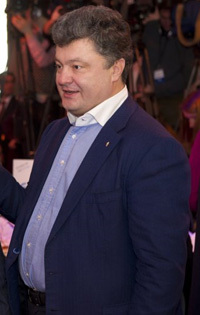 During 2013 Pinchuk was an advocate of the partnership agreement with the EU, and an outspoken critic of the alternatives proposed by the Kremlin, and by ousted President Victor Yanukovich. Pinchuk, who controls 100% of Interpipe through a Cyprus-based offshore structure, has also financed lobbying against Russia in Washington, Paris, and London. That story can be followed here. Pinchuk’s steel and insurance businesses in Russia have suffered as a consequence. Russian countermeasures have also struck at the confectionery business of Ukrainian president-in-waiting, Petro Poroshenko, and the banking business of Igor Kolomoisky, the acting governor of Dniepropetrovsk. Interpipe generates most of Pinchuk’s income when his creditors allow him to pocket it. Since 2011 the group’s cashflow, trading schemes, and dividends have been covered by restrictions and close supervision of its international bankers, along with the Italian export financing agency, SACE. Last November Interpipe defaulted on a debt repayment to them of $106 million. The company’s current debt has yet to be reported for 2013; it is believed to be just over $1 billion. The banks, led by ING of the Netherlands, Commerzbank of Germany, and Royal Bank of Scotland (RBS), are owed more than $543 million; SACE, $156 million. In December Interpipe also defaulted on undertakings to holders of $200 million in Eurobonds; first issued in 2007, their maturity date has been postponed from 2010 to 2017. Interpipe usually produces its draft financial report for the previous year in the month of May. Negotiations with auditors Ernst & Young were protracted last year, and the audited financial statements not released until August. The results estimated for 2013 by industry analysts indicate that revenues fell sharply in the second half of the year, and there was no improvement from the pipe and wheel divisions to lift the first-half earnings figure of $174 million. Only by selling low-value billet steel in western markets was the earnings figure maintained by year’s end. In 2012 Interpipe declared a bottom-line loss of $71.7 million on revenues of $1.8 billion and earnings of $304.6 million. In 2013 revenues and earnings are believed to have dropped by a third. The loss line is projected to have risen correspondingly. “It’s likely to be three digits”, according to one source. “How big the loss to be declared depends on what Ernst & Young agree on the size of the asset impairment.” In the financial reports for 2011 and 2012 revaluation of assets has been greater than impairment and writedown. A Ukrainian industry source claims Pinchuk and Ernst & Young calculate these numbers differently. Since the rebellion against Kiev began in the eastern regions, following Yanukovich’s removal from office on February 21, Interpipe claims there have been no interruptions to work at its Dniepropetrovsk plants. Russian sources say cargo movement has been as usual on the regional railroads bringing in raw materials and taking goods to market; this may be about to change in Donetsk and Lugansk regions, where separatist groups have been enlarging their administrative control. Port operations at Mariupol, Nikolaev, and Odessa are also reportedly normal, though maritime sources claim cargo volumes are down. Interpipe is likely to suffer financially. The collapse of the Ukrainian budget makes unlikely that at least $150 million in value-added tax, collected but not reimbursed, will be repaid. New measures introduced by the International Monetary Fund (IMF) are putting pressure on Interpipe to repay debts of more than $69 million owed to gas supplier, Naftogaz. State-subsidized gas prices are being eliminated, and Interpipe must calculate that this year it should be paying about $450 per thousand cubic metres; that’s two-thirds more than the $268.50 price Yanukovich arranged with the Kremlin and Gazprom last December. Last autumn, before the November loan default was announced, Pinchuk was reported to be seeking international bank intermediation for the sale of some of his assets. There were no volunteers. Sources close to the company now say Pinchuk may seek support from the incoming president Poroshenko (right)for the merger of some of Interpipe’s assets with other domestic groups. Interpipe’s railway wheel division is one of the assets reported to be on the table. Production there was already contracting by about 10% last year. Dwindling sales to Russia, as well as to the Ukrainian railways, will cut the division’s revenues this year by up to 20%. The Ukrainian candidates with cash and a potential interest in Interpipe – Rinat Akhmetov and Igor Kolomoisky – aren’t friendly: they have been targeted by Pinchuk in a billion-dollar compensation claim in the UK High Court. Other Ukrainian steelmakers, like Sergei Taruta and Konstantin Zhevago, are reluctant to accept Pinchuk as a business partner.